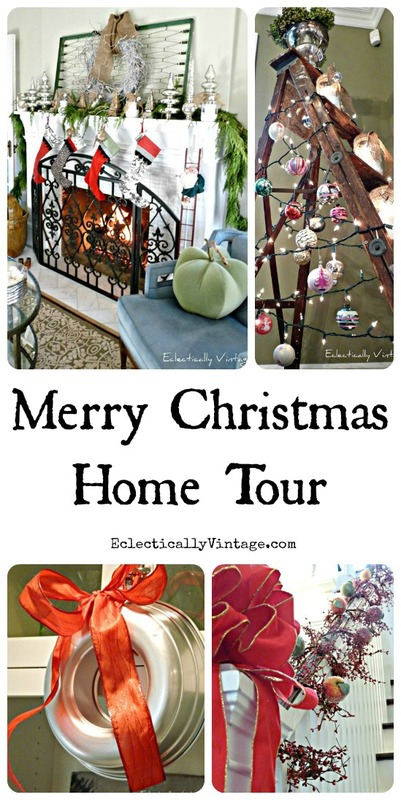 Christmas Open House Tour - Tons of Christmas Decorating Ideas! Come on in, grab a cocktail or a piece of fruit cake (do people still eat that?) 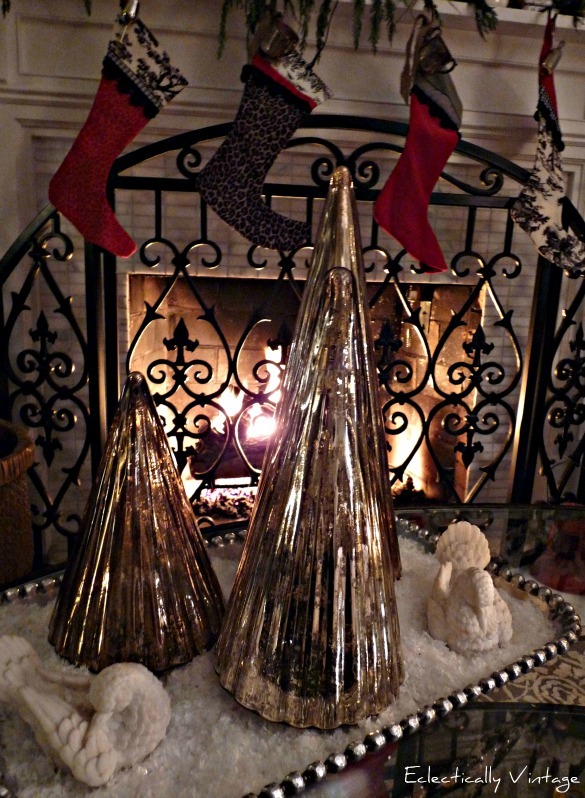 and have a look inside my home that’s all blinged out for Christmas! Make sure to check out my other Christmas house tour – it’s completely different but equally amazing! 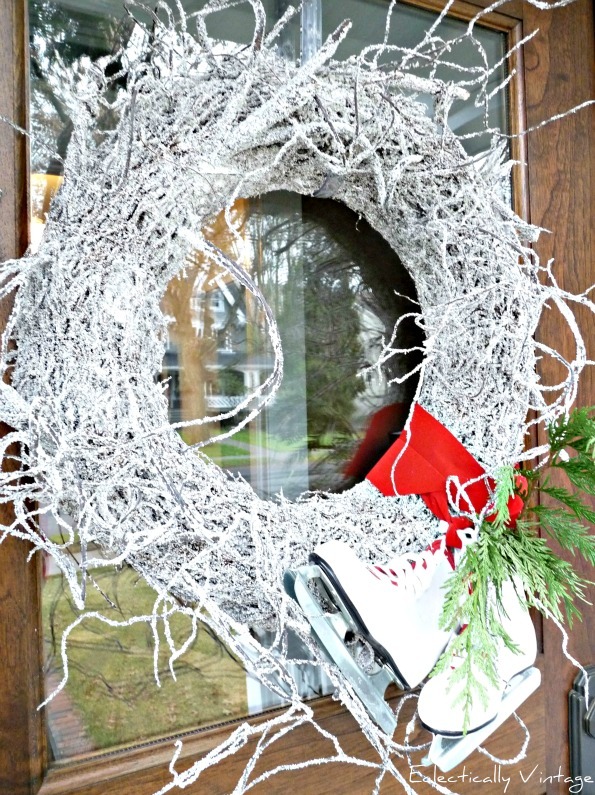 Welcome – the front porch is simple and sparkly so I can enjoy the festivities instead of having pre-Christmas conniptions! 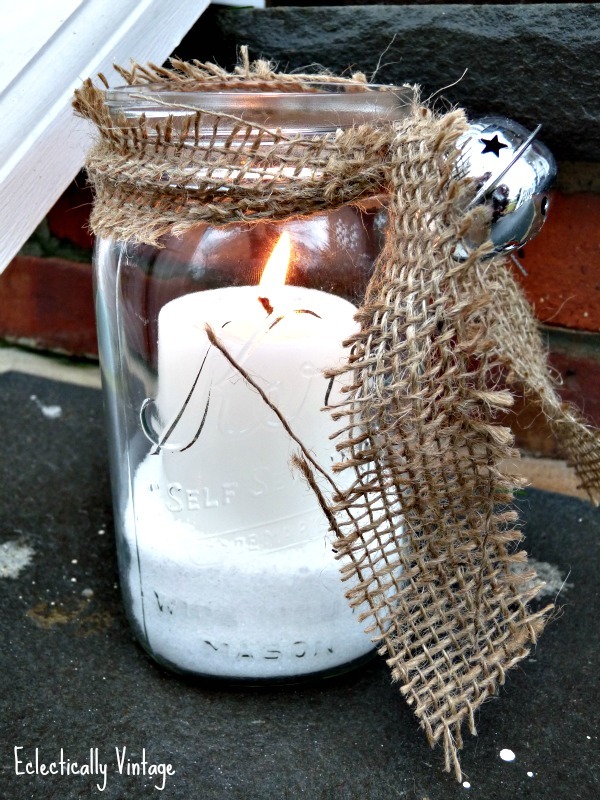 A snow covered twig wreath on the front door, my old wooden sled propped against the wall and some snowy mason jar candles combine with fresh garland wrapped around the columns. Click here to see more of the front porch. 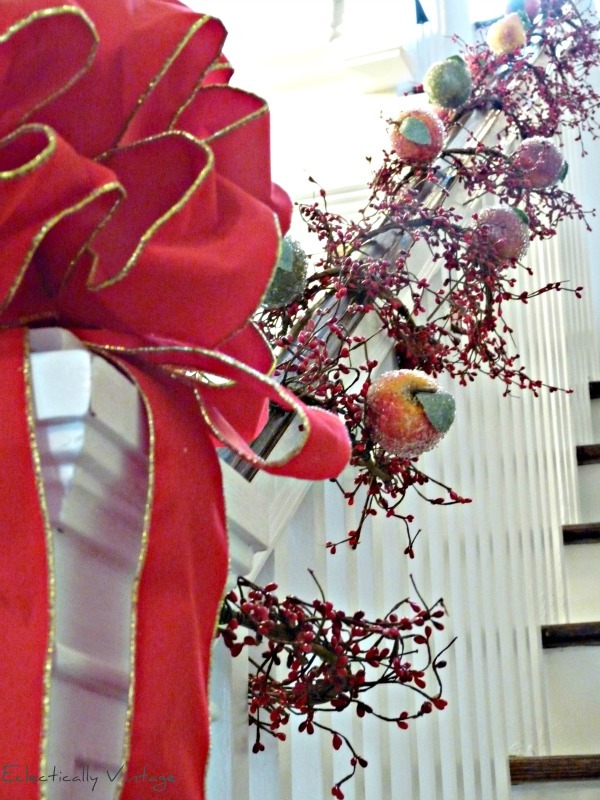 The banister couldn’t have been simpler – just wrapped a few strands of berry garland and added some “sugared fruit” picks. Also in the foyer, a neglected apothecary chest brought up from the basement was easily turned into the girls Advent calendar. 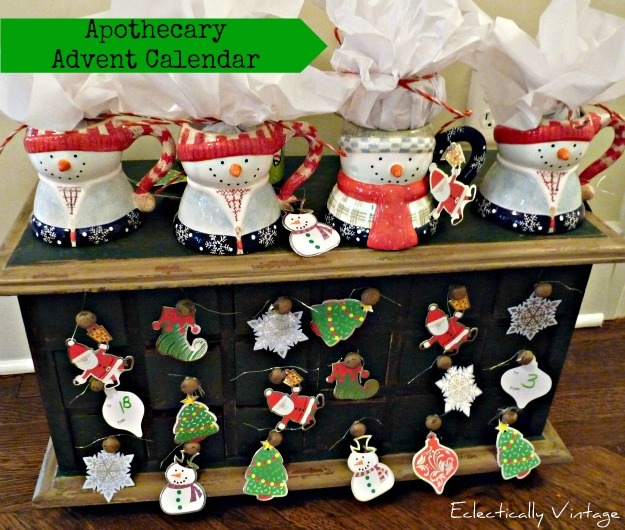 Click here to see how I transformed the apothecary chest. Who says a Christmas tree has to be a tree? Not me! 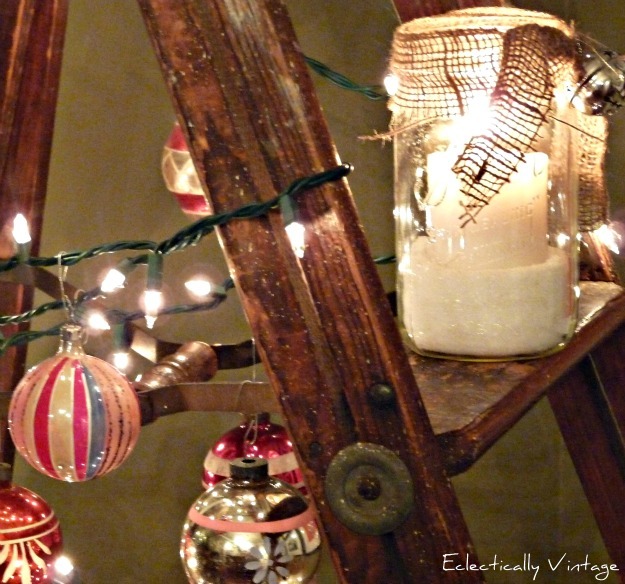 That’s why I went with a crusty old ladder turned Christmas tree in my dining room. Strung some lights, hung more vintage shiny brites, added an old silver trophy filled with hydrangeas and put a few snowy mason jar candles on the steps. Unique and fun in the dining room (click here to see more of the Ladder tree). Kept it super simple in the kitchen and hung a couple of food inspired wreaths. 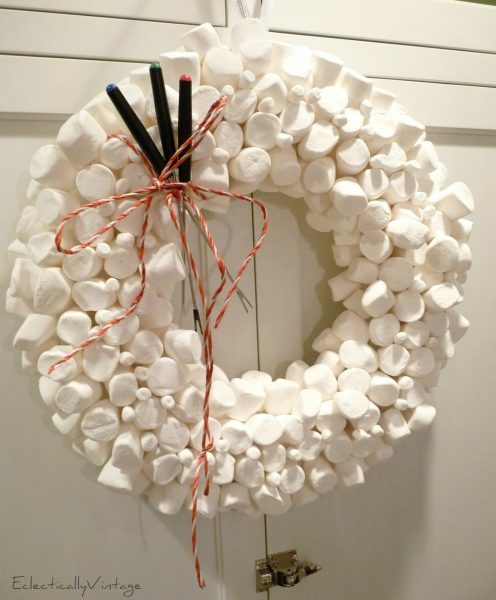 The marshmallow world wreath is super easy to make (click here). 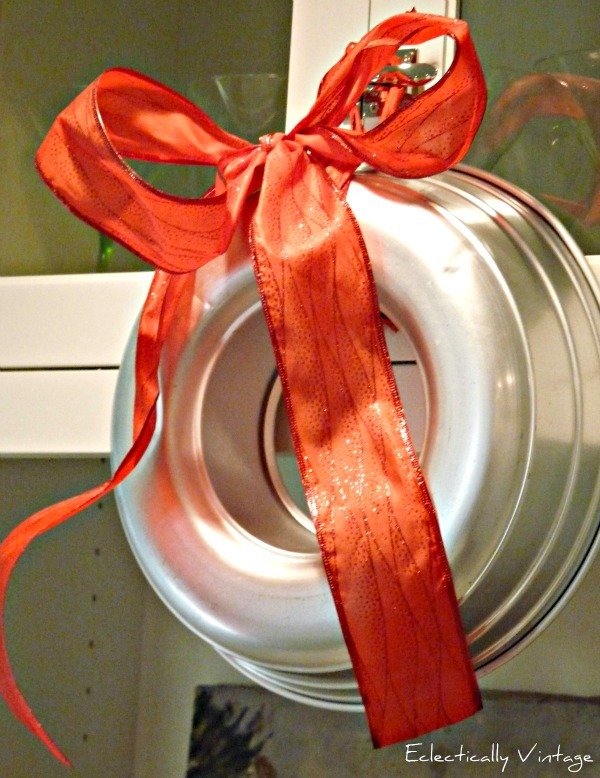 With a festive bow, a dented old jello mold transforms into a perfect kitchen wreath (see more here). Santa is sure to love the mantel this year! 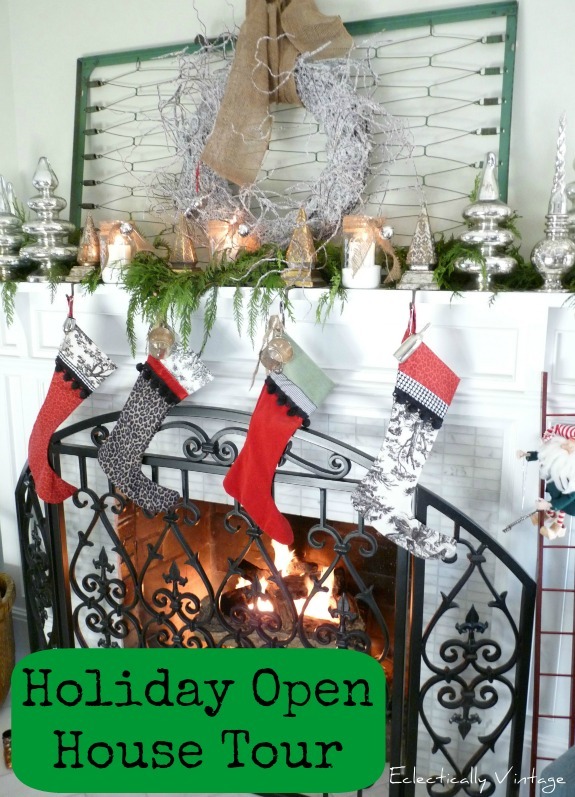 It’s blinged out with mercury glass trees, snowy mason jar candles, fresh garland, a snowy twig wreath (like the one on the front door) attached to this fabulous vintage green crib bed spring. 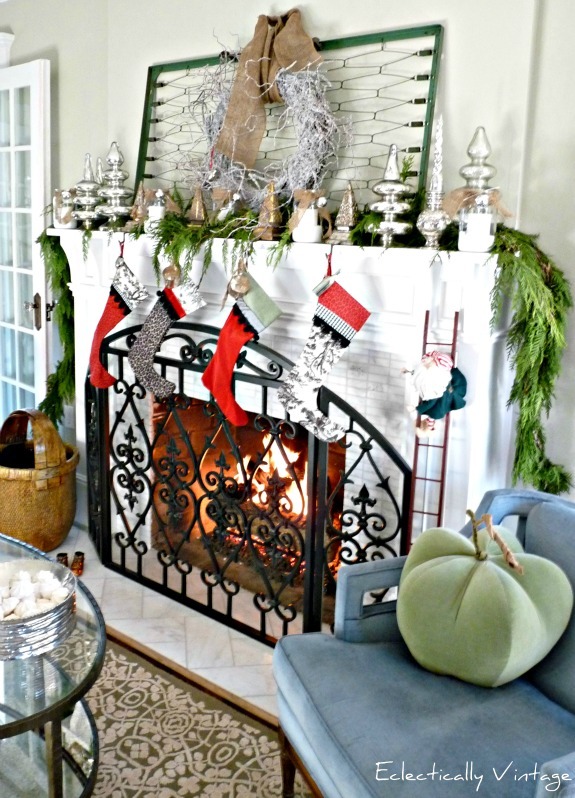 The leopard and toile stockings are so much fun (click here to see more mantel). The girls baby cups were tied to their stockings with strips of burlap. How else will Santa know whose stocking is whose? 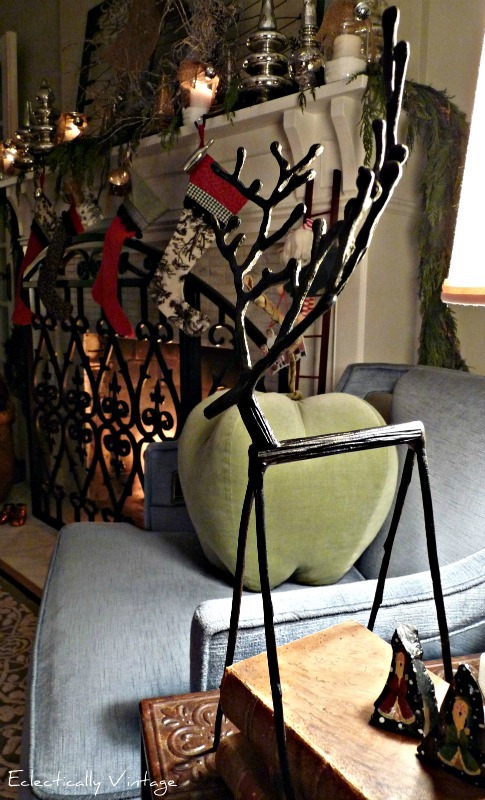 Love this skinny little reindeer and the pieces of Santa painted coal – given to the girls one year in their stockings even though they were nice all year! 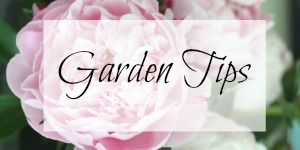 On the coffee table in front of the fire, sit more mercury glass trees on a silver tray filled with snow (can you believe I even found a bag of snow at the thrift shop) and a couple of Italian alabaster doves (you guessed it, thrift shop). 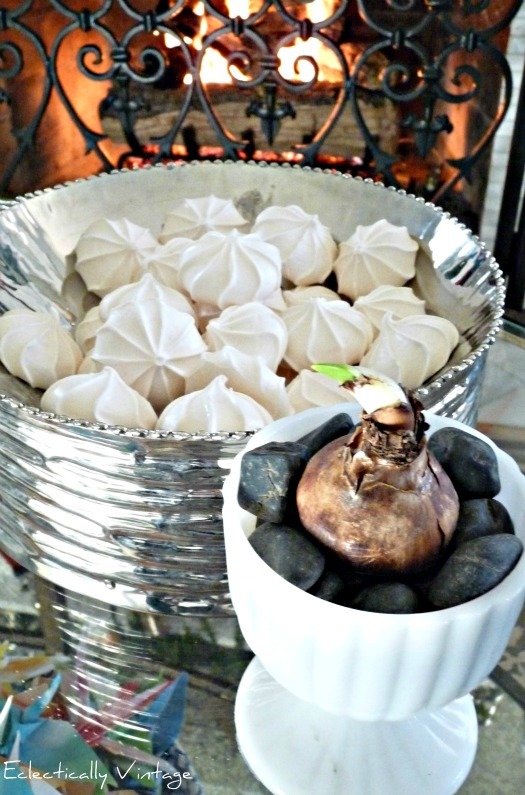 A silver bowl is filled with meringue cookies (love me some Trader Joe’s). My girls didn’t like them and wanted to toss them but I rescued them for a white Christmas display! A paper white is waiting to bloom in a vintage milk glass cup. And the mac daddy of Christmas trees is wearing burlap garland, family picture ornaments and a few vintage ones from The Hubs thrown in for fun. An old galvanized bucket sits waiting to be filled with lots of presents on Christmas morning. 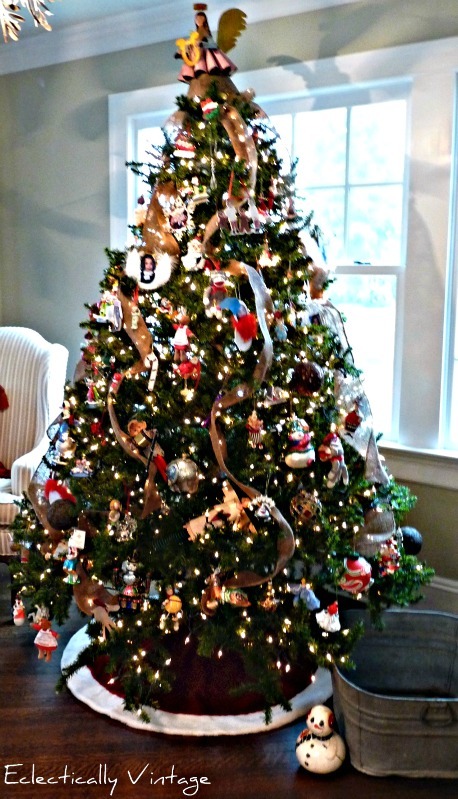 Lots more pics of the tree are here. Hope you enjoyed checking out my abode all decked out for the holidays. 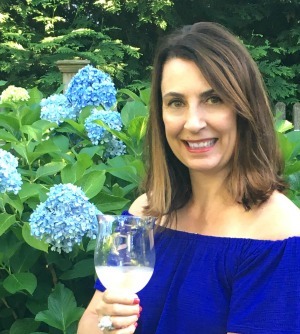 Want to see how the rooms look without all their Christmas finery – take a look at my house tour. 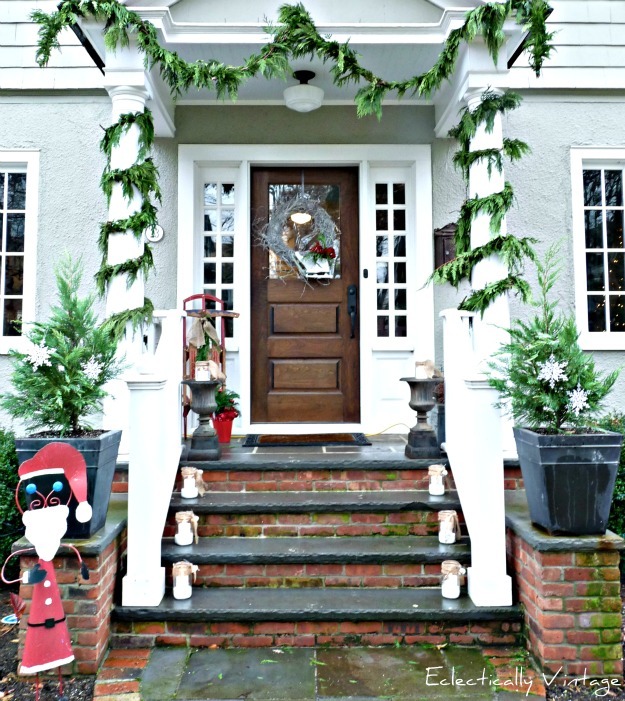 Check out my current Christmas House Tour – completely different look! Kelly, I am blown away!!!!! Love it all especially the ladder! You are one talented elf! It all looks beautiful, cannot believe how ahead of the game you are!!! Absolutely love your twist on Christmas! The ladder is awesome. 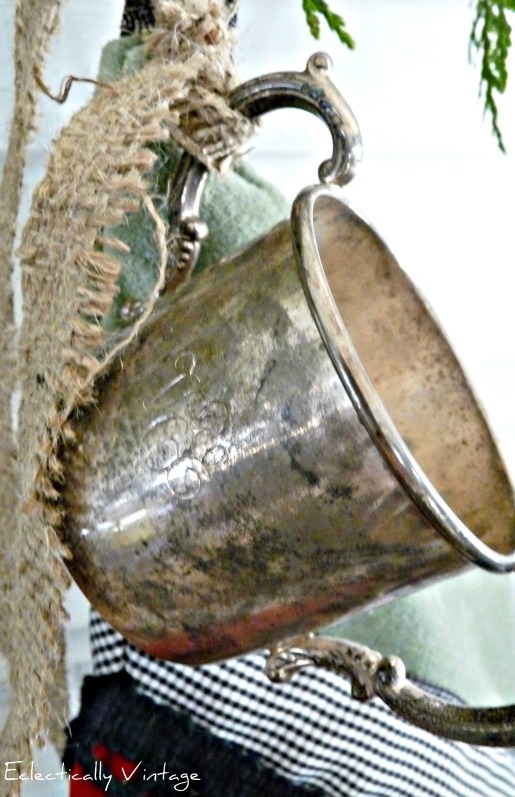 Love all of the mercury glass and esp the child’s cups on stockings…vintage toudh! I am loving the vintage family pics with the burlap garland. Beautiful! Can’t wait to take the house tour!